I love the idea of this series so much. Three authors re-envisioning parts of history and classic literature by giving them a fun mix up of additional genre elements such as magic and the supernatural. While I enjoyed how it worked in the first book, My Lady Jane, sadly this sequel didn’t quite live up to that one. 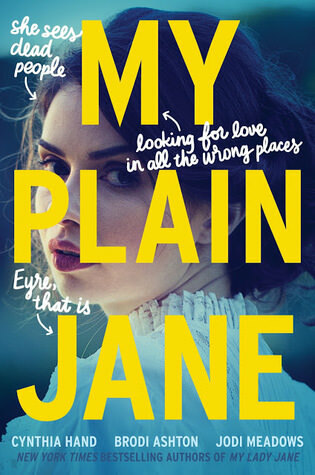 My Plain Jane is a retelling of the classic, Jane Eyre by Charlotte Brontë, which I have not read. I know, I know. But I haven’t. I do have some minimal knowledge of the original story and was looking forward to meeting this version of Mr. Rochester and of course Jane herself. Here we have a Jane that can see and speak to ghosts. In fact, her best friend is one. With the Society (a Ghostbusters type of organization that removes disturbing spirits from places they haunt) coveting her skills, she takes off to a governess position and meets Mr. Rochester. But everything is not as it seems at Thornfield Hall and there is more than meets the eye going on with the Society and Jane is caught right in the middle, as well as her friend Charlotte (heh) and Alexander. I must say, I mostly enjoyed the characters and I think the authors did a good job with giving them each a distinctive voice. Charlotte was a standout for me, someone with a lot of determination and I loved how she liked to carry around her notebook and jot everything down for inspiration for a novel. I also loved her dynamic with Alexander who was determined to push her away at first yet slowly came to realize how great she was. Helen, the ghost, was fun and added a lot of humor to every scene she was in. I did like Jane, mostly, but was quite confused by her infatuation with Mr. Rochester and so quickly. She barely exchanged two words with him before she was ‘ falling in love’ and even paused in the midst of an emergency to make note of it to herself. It actually felt out of place from the rest of the novel and like it was only there because it had to be. It seems some of the bizarre happening around Mr. Rochester line up with the original story in many ways and a lot of the secondary characters make an appearance as well but after that the book takes a turn and everything goes on its own path completely. I’m still unsure on how I feel about the supernatural flair to the story. These stories are meant to be fun and silly and it worked really well with the first book but for some reason I found it more on the ridiculous side with My Plain Jane. I just couldn’t get passed some of it without major eye-rolling. Not to say there weren’t any great moments! There were some references to modern pop culture sprinkled in and those often brought a smile to my face. I did end up needing to skim bits and pieces after the halfway mark when it was obvious I wasn’t getting a strong connection to the story. I so desperately wish I could say I enjoyed this one more. I think fans of Jane Eyre may get a kick out of seeing these characters in a new way since there is already some familiarity there and perhaps that may have been the case for me if I had read it before too. So this may be a case of ‘it’s me not you’. If you like silliness, humor, and retellings you may enjoy this one. This review makes me so sad. I was a fan of the first book. I loved the silliness parody type humor. Sorry it didn’t work for you the second time around. LOL I just didn’t love her and I thought I would. Perhaps that’s the way she is supposed to be though. Oh no! I hate that the second book didn’t live up to your expectations! It’s always hard when the first book was wonderful. This one is on my list, but I was waiting until I’d read the first one before starting it. I hope your next read is better! I hope you’ll end up enjoying more than I did! Awww, I’m so sorry to hear this didn’t work well for you. I absolutely loved the first book in the series and had such high hopes for this one. I’m sure I’ll still read it but I think I’ll have to lower my expectations for it. Great review! Aw, I’m sorry to hear you didn’t really care for this one. I still need to read the first, so I’m glad that was a winner for you! The first book is a lot of fun!